An unexpected phone call through to the Map Department recently proved to be the start of a little adventure that had a wonderful outcome. A member of the public offering us a map which had been hanging on her wall for a while, which is mentioned in Peter Whitfield’s book ‘The Mapmakers: A history of the Stanfords’. Mention was made of Khartoum, but apart from that no further information was initially forthcoming. After accepting the kind offer and arranging a time to have the map handed over, map staff found Whitfield’s book, which mentions the map. It turns out that Stanfords, the famous Victorian London map makers, had produced a facsimile of a map made by General Gordon in 1874 showing his journey in the Sudan, due to great public interest in Gordon after his death in 1885 at the siege of Khartoum. Whitfield’s book shows the map, with the Bodleian acknowledged for the copy, which gave the donor cause to contact us. Of more interest though is the fact that ‘the whereabouts of the original manuscript of the map is unknown’. This caused a bit of head-scratching amongst staff here, the donor had said we had a copy, but all we held was the reproduction issued by Stanfords. The donor and members of family turn up one cold and wet April morning, and hand over the map. It’s immediately apparent that this is the original, whereabouts previously unknown, and we’re thrilled to have been presented with such an item. As well as the route taken from Suakim to Khartoum Gordon includes topographical information and sketches and a letter to a friend, ‘ My dear Lestrange…’ which gives details of the trip made but begs Lestrange not to come if ‘the changes are dangerous to your health…do not risk coming if Doctor says no’. 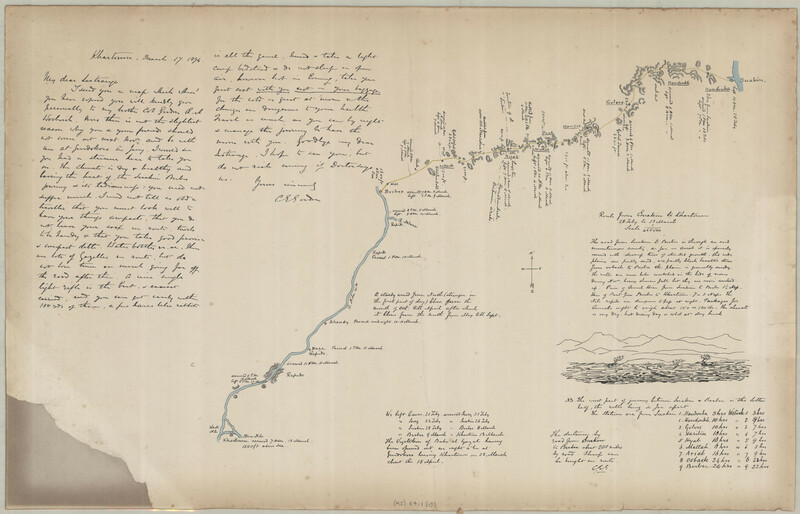 [General Gordon’s journey from Suakim to Khartoum, 1874]. (MS) E4:1 (19). This entry was posted in Uncategorized on 16 July 2014 by stuart.